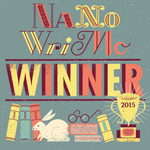 I’ll be joining the usual list of suspects as a member of Silver Beaver Cabin for the third session of Camp NaNoWriMo in a row April 1st-30th of this year. 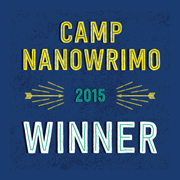 Camp is a little more relaxed an affair than regular NaNoWriMo in November of each year. Not only can you set your own word count goal, but you can also choose to work on what inspires you whether it be fiction, non-fiction, screenplays, book covers, or illustrations. Being able to set your own goal, can also make it a good test run for people that want to attempt NaNo, without all the pressure of the 50k goal right from the beginning. I write entire novels by pulling them out of thin air as I go along. Rarely if ever, is anything I write planned in advance, except brief little snippets of scenes throughout the story I have foreseen ahead of time. The getting from point A to point B stuff is always an interesting feat for me. I’ve been known to skip or gloss over entire sections of novels to keep momentum getting to the next part when I don’t know what to write in between two sections. Loss of momentum, not just perfectionism is what kills many stories before they even see light of day. Get it on paper, save the fear and self loathing for this masochistic thing we like to call editing…that comes in December…or May…or August. See you all at Camp! Someone better save me some smores! Someone asked me recently why a lot of the stories I write contain such damaged characters. I’ve been asked more than once why the stories often have a melancholy tone, or deal with difficult subjects. I’m sure many people are skilled at writing stories that are sunny escapeism, but those don’t seem to be the sort of characters that come to me with stories to tell. I get the inspiration for my stories through a variety of places, music, dreams, and sometimes stories of their own lives that people have told me over the years, though no one character in my novels exactly resembles any one specific person. Sometimes when one of my characters deals with a difficult past, or a disturbing situation, it may be as simple as trying to work those thoughts, or that situation out in my own mind. I will likely never tell which ones are real, and which ones only happened on paper unless asked by someone privately to tell them. Have you ever had something you loved so much as a child that it hurt you like crazy to lose it? Even now at 43 years old I’ve been sitting here wanting to cry my eyes out thinking about my favorite blanket. It all started when I ran into this picture online, of a blanket just like the one I used to have. I got it for christmas as a kid, and throughout most of my life, it was my prized possession. Unfortunately it was stolen several years ago, and ever since occasionally, especially when I am really stressed out, or sad I really start to miss it again. As I said before, it was my security blanket. For years and years it went with me everywhere I went or moved, and I never slept a night without it. Having it ripped away hurt more than it probably should, but I am sure almost all of us have at some point in our lives lost something that meant a great deal to us. I’ve been searching for 10 years now for one like it to no avail. Every time I see a listing for one online, the item has already sold, and sometimes I wonder if I will ever have my blanket back. Well it won’t be MY blanket, but one sort of like it, and I know that. Just call me Linus. I know it wouldn’t be the same, but believe me getting one like it back again would make me feel a whole lot better. Yes I know, I haven’t been around to post much of anything lately. The blog has been far from my mind most of the summer this year, because there has been so much going on offline. For starters there has been a little progress on our housing situation. For now we are still right in the same apartment we have been in all along, sans roommate. Unfortunately, this means even more behind financially than we were before, even if things are a lot more peaceful, or as peaceful as things can be with a wound up toddler in the house. Hopefully within the next month we will be able to close on the house my mother in law has been buying for us to rent from her. Even as I write this, I am still thinking of the events of these last couple of weeks, especially thankful, because it all came very close to never being able to happen at all. We first went to see this house back in June, after having been outbid at the last second on another, something that had me crying my eyes out for days, I must admit. I had really loved that house, I mean REALLY. I guess looking back now, if it would have really been meant to be our house, that wouldn’t have happened. After a few days we went back to the drawing board, and started looking for something else, and a few weeks later the realtor had a house to show us that had just been put on the market, so we went up to look at it. I was trying really hard not to get my hopes up this time, even as I walked through what turned out to be an absolutely gorgeous house. We talked it over not long, before my mother in law decided to make an offer on it, before we even left the town where the house is located that afternoon. After that began the very very long process of trying to get everything finalized with the bank. The bank is being slower than molasses in a snowstorm. I realize that banks are more cautious about who they give home loans to nowadays but I think this bank is taking the cake on how many verifications they claim they need. They even made mom file the paperwork all over again, because it had been over 6 months since she had first applied for the mortgage, even though it’s because of their being slow, not anything we haven’t done. All along I have been hoping and praying that nothing would derail all this, and that we would finally be in a home we could afford, and have a little room to breathe. Imagine if you will our horror last month when we saw a mysterious phone call from my husband’s uncle on our caller ID. Most people wouldn’t consider this unusual, except for the fact that he never ever calls us. Unable to reach John’s mom, we called the number back, and got no answer. By this time we were really freaking out. It wasn’t until an hour or so later that we finally got a phone call explaining to us what was going on and confirming at least some of our fears. John’s mom had suffered a massive heart attack early that morning, but in true Mama style, hadn’t wanted to worry us. She had already gone through surgery, and had forbidden anyone to call us, because she wanted us to hear about what had happened from her. She has since been released from the hospital and so far seems to be doing better, even if the doctors say she may need another surgery in the coming months, to prevent her heart from having further problems, just as a precautionary measure. This whole heart attack thing came completely out of the blue, Mama had no known history of heart disease, and up until this point had been reasonably spry even for being 82. Ever since all this happened, I have been on pins and needles over this, and so many other things. It’s not just because I am worried about mom, or that I know just how close we came to our dream over this house suddenly not happening. I know as well as John does, if something had happened to her, we’d be homeless and on the street in a matter of weeks, with nowhere to go. Part of me is going to be scared to death over all this until the keys to the house are in my hand, and we’ve finished moving in. Is it wrong of me to just want a stable place for Thor to grow up, where we can afford to live without mom having to help us cover our bills for the month? Like it or not, we just can’t afford to live where we are living now much longer. We’re sinking fast here. For now all we can do is stay busy, and do the best we can, about the things we can control, lord knows there is more than enough that we have no control over lately. We can’t make this bank thing go any faster, any more than we can make money we need all too badly appear out of thin air. Thor enjoys walks, so we take him on a lot of walks, and trips to the park, one thing that at least for now, is an activity we can do within walking distance of the house that won’t make us break the bank trying to afford bus fare. He loves to take actual walks around the block in the evening now, and not just stroller rides. Of course, we have a harness for him, to make sure he stays safe, while it lets him walk all on his own, just the way he likes it. That would be the little turtle backpack looking thing you may have already seen in the photos posted here. Believe it or not, he really does enjoy wearing it, and actually gets excited about putting it on, because he knows when he does, it means he has a bye bye coming. His favorite thing on trips to the park, or on walks is to find himself a nice stick to carry around with him. Occasionally he stops, and tries to draw on the ground using said stick. Sometimes I wish I could still be as thrilled about the little things as he often seems to be. Sometimes, watching him, I can almost remember what it was like to be small, and have every day be such an adventure. I try to remember some of the things that used to make me happy. Thor now loves many of those same things, even if he is very different, and loves things that are quite uniquely his own style. Maybe someday I’ll once again get as excited about Mister Rogers, sticks and empty laundry baskets. Well, I still do love Mister Rogers as much as I always have , so I guess one of of three ain’t bad. Yes I misspelled the title of today’s blog post on purpose…because I can. Life still seems to be stuck in that same stressful holding pattern, of waiting for answers. It’s hard knowing things are out of your hands when it comes to what your family’s financial situation is going to be like for the foreseeable future. Sadly worry isn’t really getting me anywhere, or I’d be a millionaire from doing it by now. It’s hard to find ideas for what to write about when I’m stressed. I remember a time when writing was my escape from it all. I wonder what’s changed? I go days at a time without writing now, and then try to play catch up when I do write. Sometimes I may get interrupted half a dozen times trying to make one post by the baby, the hubby, or sometimes even the cat, thinking he needs to do the typing for me. I love my family, I really do, but sometimes I think that in order to get something resembling serious writing accomplished I am going to need to padlock myself in a room a few hours a day somewhere I don’t have the luxury of wi-fi. One thing uncertainty has always given me is an urge to plan ahead. People who don’t know me are usually amazed at my ability to pack rat the necessities far ahead of when we need them. I’m not a hoarder, but I do believe in having some things set aside in advance of when you need them. You never know when there will be an unexpected emergency, or your kid will have a sudden overnight growth spurt. When I didn’t know how our finances were going to change, the first thing I did was start trying to plan for Thor this winter. It’s hard enough to find little boys clothes around here on a good day, let alone coats or anything of that nature, so that was the first thing I went after, making sure he had two sizes worth of decent winter coats and footy pajamas to last him through winter this year. As long as he isn’t in a larger toddler size by spring I should hopefully have most of his clothes except pants covered for the winter. My friend Christie knitted him a nice warm hat, that thankfully he seems to love so far. Boys jeans are proving to be harder than anything to find for some reason. Thor already wears a larger size in shirt than in pants anyway so “outfits” usually aren’t that good of an option unless the pieces can be worn separately. I really miss the old Garanimals section of the kids area of department stores, but none of the stores around here seem to carry them anymore. The stores I have seen in my area are like a sea of little girls clothing, with hardly a rack of boys things in sight. This is precisely why when I actually run across decent boys clothing at yard sales, if I have the money, I clean the place out. Outside of underwear and shoes, I don’t think there’s much parents aren’t better off buying used for all the longer kids are going to wear it, well, unless it’s a nice outfit for a special occasion. The styles of girls clothing do tend to change frequently, but with boys, thankfully, people tend to stick with the classics, sports, trucks, dinosaurs, and super heroes, so they don’t seem to go out of fashion nearly as quickly. Then again I’m rather odd myself, so I don’t know why any of that surprises me anymore. This post, like so many others is turning into a ramble, without that much of a central point. I guess I am writing just to write. I need to do more of that. It’s getting easier now that I’m finally doing it. Maybe that means if nothing else, at least this mission, for now, is accomplished. Yes this has been me as of late, well, minus the viking helmet. As much of a plan as I may have for one story or another, the words and sometimes the motivation seems to evaporate before I get it written down on paper. When did writing become so hard? I remember a time when I was young and it used to be so easy. I used to have a million ideas, and I would wake up in the middle of the night and write all sorts of things that couldn’t wait until morning. I guess I have no idea where my enthusiasm went, probably drowned out by my now adult life, and my seemingly never ending ungodly stress level. Sometimes I worry my writing won’t be good enough. No one close to me ever seems to want to read it anymore, not that they ever read it to begin with. I’ve had a printed copy of my second novel sitting here on the book shelf and year and a half now, and even my hubby hasn’t given it so much as a second glance. Several years ago my friend Penny would have been standing next to my printer with her hands out waiting for the next chapter. She died from cancer a few years ago, and finishing a project since then is so much harder, especially without my one person fan club, and her encouragement. That’s one of only a very long list of things I still miss about her, and always will. Penny didn’t just passively read what I had written, but loved to give me her input, encouraging things she believed would make what I had written even better. I think all of us need that sometimes. We need to hear not only what needs fixing, and what we can do to make improvements, but also what is good and going right. In other words, this is what works, and these are the things that would make it even better. Sometimes I get so caught up in believing it all has to be perfect the first time, that it completely stops my momentum. I get discouraged believing no one will ever want to read it, no matter how much love and hard work I put into telling the story. I ask myself what I do it all for. If the story doesn’t get told, it is wasted. What good are all the infinite worlds inside your head, if you are the only one that ever journeys into them? I keep trying to remind myself of these things, and keep edging forward, even if baby steps. I don’t want to believe I have an irretrievable imagination. Even if the old ideas won’t return, or seem childish now through older eyes, I hope I haven’t ceased to invent new ideas, new universes, and those that reside in them. I don’t think my mind would be happy at all, limited to just one world. I make myself sound like such an old fart when I talk about the past, even though I’ve barely cracked middle age. A lot of things in this world have surely changed, and it seems they are changing more and faster every day. I don’t know when the things of this world got as “disposable” as people nowadays seem to believe that they are. Life didn’t seem to be like that in another time that I remember. Maybe that’s just another thing that’s changed. I can remember being a small kid, and now I look back on everything I always thought I wanted to be, and what seemed to be important then. I don’t ever remember a time when I didn’t want to grow up and be a mom. I used to dream of being a famous singer, or a famous writer. I guess I still do dream of the singer and writer part, but sadly anymore you have a snowballs chance of getting to sing unless you are a size 0, barely outta high school and have the “look” the record execs are looking for. When did I kinda give up on my dreams? Maybe it was as I got a little older and teachers and other people told me that only the most beautiful and the best deserved to do those things. I don’t know why I let them make me feel so unworthy, but I did, and to this day I still struggle with it. Maybe it was when my mom told me that if I couldn’t make a living at it, it wasn’t worth doing and I would be an idiot for trying. Dreaming was going to get me nowhere in life. That stung, those words still hurt. Today I only sing with the radio, and as many awards and compliments as I’ve ever gotten for my singing, I’m still so self-conscious that my husband has heard me sing only once in the almost two years we’ve been together. As much as I dream of singing, I know no band out there wants a 40 something slightly overweight soccer mom at the mic. Maybe I have to accept that dream is one who’s time has passed. Writing is something I still dabble with, but I’ve somewhat almost given up on as well. I’ve written 3 complete novels and several partial ones now, but no one seems to want to read anything I’ve written. My mom still believes it’s a waste of time, and my husband only seems to beat around the bush and come up with reasons not to when I ask him. It almost feels pointless sometimes to write all these things if no one will ever read them. Why do I keep doing it? Maybe because I have to. Maybe getting everything down on “paper” is the only way I know to let out everything I can’t say otherwise. Maybe what I thought I wanted to be is still who I want to be after all. Self confidence has never been my strong suit. I spend so much time second guessing myself, and asking myself what if. This is something I have dealt with for a long time now. I don’t have as many rough patches as I used to, but some days are easier than others for me. For a long time there things were going so well, and I was finally happy and things really seemed to be looking up. All it took to turn things on its head for me was a whole lot of horrible things in a very short amount of time. In a matter of months I lost almost everything I owned in a break in, and also lost my aunt, my father and a childhood best friend. In the last year alone I’ve also lost another aunt, a mentor who was like a second mother to me, and my grandfather, not to mention our beautiful white kitty. There have also been many good things that have happened that have made it all easier, like getting married to my wonderful loving husband, and the birth of our beautiful little boy. I know I have a lot in my life that is good, so I don’t understand why I’m not floating on cloud nine. No, I’m not depressed, but I don’t feel nearly as happy and optimistic as it seems I should be. My son is the thing that by far makes me the most happy. He smiles and I can’t help but smile with him. He laughs and I forget everything else but him. I don’t know how he does it, but it’s the most amazing thing. I don’t know what I would do without him. Even when I’m tired and I grumble and complain, he makes everything completely worth it for just one of those smiles. It’s just that sometimes I wish I could do better for him. I don’t have much money, and making it paycheck to paycheck is a huge worry for us. With John unable to find work and my small income all we have for the moment, money is always a huge worry. I do the best I can, and try to stay ahead on the things that I can. Maybe my packratish tendencies make me a little crazy, but I’m always trying to keep diapers, clothes and formula at least a bit ahead of when we need it. I’ve gone without enough in my life, that I don’t ever want to take the chance on my son ever needing something and it not being there. I’m always buying clothes a size or two ahead of what he is wearing, and putting them away for him to wear later. I guess I still have so many people’s voices in the back of my head, the ones that always reminded me of just how imperfect I was. Why isn’t the house spotless? Why don’t I have a job making tons of money? Why am I a size 18 instead of a size 4? Does any of that really matter? I try the best I can to be a good person. I have never set out to hurt anyone, well, at least not without being provoked or backed into a corner first. I write books that no one reads, that I’ve all but given up on finishing, because even the people closest to me don’t seem to want to bother to give looking at them a second thought. It’s hard to want to keep writing these stories when you’re the only person who is ever going to know anything about them. Maybe someday I’ll find my way back to optimism. I seem to have misplaced it somehow in the shuffle of one thing after another. Maybe when the smoke clears, life will go back to something resembling normal. Maybe we will have reason to hope and not so much reason to worry. Keeping my fingers crossed. The snow really is coming down out there today, so today Thor and I have been at home, hanging out on the sofa and trying to stay warm. The last couple of days were a different story, with appointments, and being out on this ungodly cold we have had here the last few days. We bundled him up good, and tried not to stay out in the weather any longer than we had to between stops. I was still really glad to get home, and spend the rest of the evening snuggled under the comforter I keep on the sofa. They’re calling for several inches of snow here by morning, but I don’t plan to go too much of anywhere, so that’s just fine with me. Thor seems to be really hungry today, a lot more hungry than he usually would be. I wonder if this means that he is about to hit yet another growth spurt soon. It may be a good thing that I am putting back clothes for him at least a size ahead, he surely doesn’t seem to stay in one size for very long at all. The sleepers that we bought him at Christmas that were so big are now fitting, and some of them are already a little small. On other good news, John said we may be able to get the new sewing machine this weekend. Baby allowing, maybe I will be able to start making some things within the next couple of weeks. I think that would be really fun to do again, even if it’s been a long time since I’ve sewn anything. I used to do it quite a bit when my older kids were younger. I never made anything really fancy, just play clothes for them, and little costume pieces, like the cowboy vest I made for my older son when he was only about six or seven years old. Someday I would love to get good enough at sewing to make some nicer things, but nothing like that comes without practice, and the only way to do it is to get moving on it. Sure I will have to wait awhile to be able to get out to get some supplies, but that is doable. We don’t have the big box stores near where I live, and I don’t really like shopping at them anyway if I have any other options. Maybe if I look into things I will find a smaller mom and pop type sewing store that is easier to get to. I really hope so, I really don’t like shopping at chain stores any more often than I have to. Who knows, maybe having something to do for the rest of winter at home will break up some of the monotony around here, and give me something to do on days like today when the weather is not so nice out. Having something constructive to do usually does do a lot to lighten my mood. Morning comes way too early some days, and this was one of them. I had the alarm set for 6:30, but I think I woke up about 5 to check on the baby and never did get back to sleep after that. I usually wouldn’t get up that early, but an 8:30 doctors appointment was all that was available without waiting a couple of weeks, so I took it. I almost didn’t make it there on time, because the cab didn’t show up until over a half hour after I’d asked to be picked up. I’ll remember to schedule one for even earlier next time if I have to take one in the early morning again just in case. The boys were still snoozing good when I left, but were awake by the time I got home. Even with a nap after I got home I am still feeling tired, and a bit headachy from the early morning. I’ll be happy when it’s time for our eye doctors appointment in a couple of weeks and I can finally get some new glasses. I don’t think these glasses are doing very well anymore since the baby was born, and I’m having some issues with eye strain. Then again, I hate having to finally admit that I do need the glasses all the time now. I can’t read a thing without them anymore. John says they are calling for several days of snow coming up, but I’m not too worried about it until we have to go out in it Monday and Wednesday. Well really I can stay home and skip Monday if I really wanted to, seeing as that appointment is for John, but I would go along for moral support if he wanted me to. Besides I like going up to Bellevue and walking around looking at things in the shops up there, even if I really don’t have the money to be doing much shopping. For the moment Thor is contentedly playing in his pack and play. He loves to just lay in there and wiggle and kick at times while he looks at the pooh bear toys that are on the toy bar above him. He chews on his fingers, and sometimes tries to stuff his whole fist in his mouth. Maybe that means that he will be cutting teeth soon. He seems to be doing everything else a little early, so I don’t see why he shouldn’t get some teeth a bit sooner than usual too. As for me, baby allowing, I am going to take a nice hot shower and try to call it an early night tonight after I get done with a few things I still need to do. If I hadn’t already committed to doing something online with friends this evening, I think I would be in bed already snoring. Tomorrow I am sleeping in…well…if the baby lets me.